A single book might not change the world. But this utterly original meditation on art and war might transform the way you see the world—and that makes all the difference. Through a dazzling combination of memoir, history, reporting, visual culture, literature, and theology, Sarah Sentilles offers an impassioned defense of life lived by peace and principle. It is a literary collage with an urgent hope at its core: that art might offer tools for remaking the world. 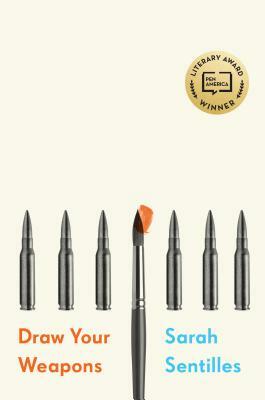 In Draw Your Weapons, Sentilles tells the true stories of Howard, a conscientious objector during World War II, and Miles, a former prison guard at Abu Ghraib, and in the process she challenges conventional thinking about how war is waged, witnessed, and resisted. The pacifist and the soldier both create art in response to war: Howard builds a violin; Miles paints portraits of detainees. With echoes of Susan Sontag and Maggie Nelson, Sentilles investigates images of violence from the era of slavery to the drone age. In doing so, she wrestles with some of our most profound questions: What does it take to inspire compassion? What impact can one person have? How should we respond to violence when it feels like it can’t be stopped? Sarah Sentilles is the author of Breaking Up with God, A Church of Her Own, and Taught by America. A graduate of Yale University and Harvard Divinity School, she lives in Idaho’s Wood River Valley.